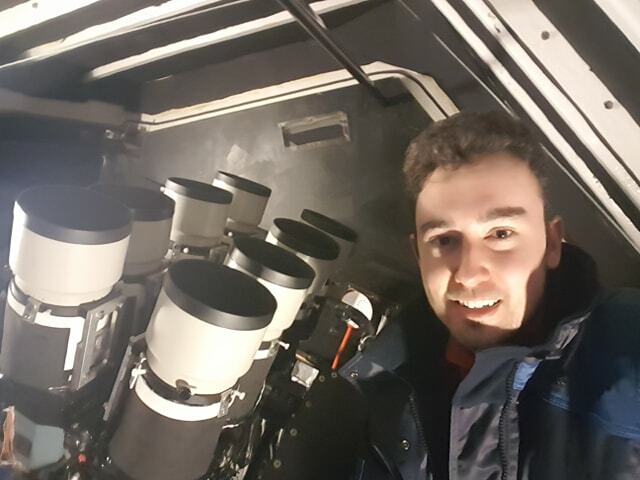 I am a second-year PhD student in the Astronomy and Astrophysics group at the University of Warwick, under the supervision of Prof. Don Pollacco. This is my sixth year in the department. View my CV here. My PhD project focuses on the imaging and tracking of space debris in geostationary Earth orbit (GEO), around 36000 km above the equator. Geostationary satellites follow the rotation of the Earth and have the same orbital period, meaning that they appear 'fixed' in the sky. This makes GEOs extremely useful for communications, but space within the belt is very limited. Because of this, the geostationary belt constitutes some of the most expensive real estate available! Previously, it was thought that the population of debris in GEO would be fairly negligible, since strict regulations are in place to ensure that the satellites are separated by large enough distances. However, the recent apparent destruction of two GEO satellites (AMC-9, Telkom-1) has provided clear evidence that a debris field must exist. 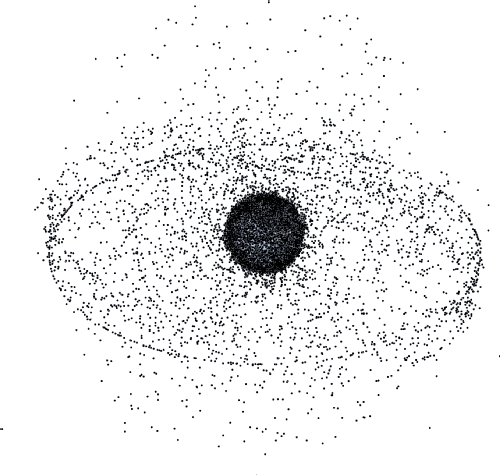 Left: [Credit: Earth Observatory, NASA] This image shows the results of a computer simulation used to track orbits of satellites and a large proportion of debris. Two clusters of objects are apparent. The most obvious of these are the low Earth orbit objects, at altitudes < 2000 km, that can be seen as a crowded sphere in the Earth's nearby vicinity. Also clear are the GEO satellites, which map out a well-defined ring in line with the Earth's equator. Other objects are either in highly inclined orbits, or have served their use and been transfered to a so-called 'graveyard' orbit. These are links to posters that give a summary of each one. I'm passionate about Widening Participation and ensuring everyone has the information they need to decide whether university is for them. I've delivered sessions on "Future Pathways" and "Access to Higher Education" in several schools in the Midlands, outlining what university is like and how to plan for the future effectively. Alongside this, I've given several talks about my research to all ages, from exoplanets to alien life to satellite debris. These have been to schools and astronomical societies, though I'm happy to branch out! "Hitching a ride on asteroids: are we the aliens?" "The very short history of exoplanets"
"The sticky issue of space debris"
If any of these appeal then please do not hesitate to get in touch.